Often times people decide to try Reiki for the first time when they are looking to go through a whole body Detox. This is a great time to allow the healing energy of Reiki in as it balances out every part of the body. I usually recommend that my clients try using meditations at this time as well to help with the detoxing process. 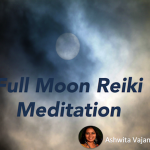 Below is the meditation that I use with clients and Reiki to help them through this process. 1. Find a space you are comfortable in. Some people prefer to do their meditations outside while others prefer to do them in a smaller enclosed environment like a bedroom. Light a candle and put on some soft relaxing music. Make the Master or Power Symbol on every wall, ceiling, window, etc of the space you are in. 2. Sit in the meditative space you have created for yourself, close your eyes and start to take some long deep breaths. Pay attention to your breathing for about 2 min and allow all of the muscles in your body to slowly relax. 3. Next, imagine a yellow ball of light suddenly appear in front of you. This light is soothing and wants to transform and soothe every imbalance in your body. It slowly grows larger and larger and fills every inch of the space you are in with a healing and detoxing yellow light. You can feel this light wash over you. It is warm, soft and feels similar to the summer sun. As it washes over you it helps to alleviate any imbalance in your body instantly relaxing you and making every inch of your body feel lighter and free from any lingering distress. Sit in this warm detoxing yellow light for 10-15min. 4. Notice if you suddenly have any issues that pop up in your mind. Acknowledge whatever pops up in front of you and thank it for the lesson it brought to your life. Then, tell it that it is no longer needed. 5. Visualize some of the detoxing yellow light in the room forming a bubble around this thought. Make a Master or Emotional Healing Symbol on this yellow bubble. The light is so powerful along with the healing power of Reiki that after about 15 seconds it breaks this thought up into little pieces until it no longer exists. 6. Allow this to happen for every thought/memory that comes up. 7. Once you are done sitting in this space give thanks for the healing/detox you have received and place one large Master or Power Symbol over the front of your body. Open your eyes. You are done. This is a meditation I like to do about once a month. I find that it really helps to move anything lingering around out of your body. Sometimes you may be surprised and not even realize that you had a small little issue bothering you until it pops up in this meditation. Wonderful meditation thanks a lot. Wonderful meditation. I have a question, hen you say draw Master or Power symbol do you mean I mthe minds eye or physically draw the symbol? Look forward to trying this meditation. Was looking for somrthing of this type for certain issues which have been cropping up. Will try and tell what happened. I don’t need to use the symbols.It works very well without it ,but if u ‘re attuned by the help of the symbols u can add an extra boost.Another way to work with symbols is to see your favourite reiki master drawing the symbols. Nice article. Brings out the method that is simple yet effective.